Men and women display their love and affection in different ways. Most women say, “I love you,” profusely and often, while most men show their deep affinity in their day to day actions. It can be confusing at times, but that’s because the truth is, men and women think differently. So, we decide to research for you and come up with a list of seven common sets of behaviors that directly demonstrate that he is in love with you, even if he doesn’t say it. 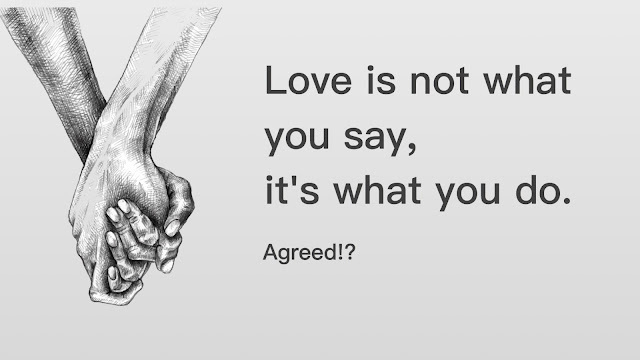 We truly believe that love is in what you do, not always in what you say. It’s easy to say, “I love you,” but true love is demonstrated in action. You know? 1. HE ISN’T AFRAID TO MAKE SACRIFICES FOR YOU. Making sacrifices for other people is easier to do when its for someone we care about. It takes selflessness, maturity, and most of all love. Relationships need a balance of mutual sacrifice or one party is left unhappy. Men who are in love feel tremendous discomfort at the thought of their lady being unhappy, and if it’s something they can prevent, they will. Sometimes they will even go above and beyond to make something work out, just because it’s really important to their partner. If your man can make sacrifices for your happiness, that is just one way he is saying, “I love you”, without actually saying it. 2. HE LISTENS TO YOU. Studies have found that women are much better listeners than men. So, when a man not only hears you but actively pays attention and responds – a skill called active listening – you can have confidence that he cares. 3. HE SHOWS HIS VULNERABILITY. Men are generally cautious when it comes to showing any behavior that can be perceived by others as a weakness. They feel that they need to keep a perfect facade of strength. But when a man is in love, he begins to let his guard down. He becomes more comfortable and allows his real feelings to show. Vulnerability can take time, but if he’s shown even an ounce, he trusts you enough to let his guard down around you. 4. HE LOVES HOW YOU LOOK ON YOUR “WORST DAYS”. Most people put effort into looking their absolute very best during those early dates. We want to look and feel good when meeting up with a potential life long partner. But, once the actual relationship spawns and we spend more time with each other, comfort levels build, and our need to impress declines sharply. We’re free to wander around in our pajamas, no makeup or messy hair. The big take away here is that when a man loves a woman, he’ll think she is beautiful no matter what she looks like. 5. HE’S PROUD OF YOU. When a man really loves a woman, he shows it by bragging about you. Yep, that’s right a real man isn’t shy about saying how proud he is of you. 6. HE STICKS UP FOR YOU. This one’s obvious one, but very important. First lets be clear, if he doesn’t stick up for you, it doesn’t mean he doesn’t love you. This is a hard one. Most of the time drama and controversy can arise with a close family member or friend. 7. HE TREATS YOUR FAMILY AND FRIENDS WITH RESPECT. This is the last one, but it is surely one of the MOST important. It’ s a given that in any relationship, a man should automatically show you, your family and friends respect. The reason is simple; he cares for you and he needs to properly treat them with care as well. While he may not like every single one of your family members or “catty” friends, he’ll keep his opinion to himself, because he knows how much they mean to you. Creating a good report with them is definitely his way of showing you he loves you, without actually saying it. All in all, the take away here is to remember to appreciate all of the little things that he does and realize that they are acts of love. He may not say he loves you as much as you say it, but his way of displaying affection is biologically different than yours. Deal?! How many of these behaviors does your man display?